Boy, the new management at Juicy Stakes sure wants us to check out their poker room! First they increased their weekly Sunday GTD to $17,500 and now they've doubled the prize pool for their monthly FPP Rake Race. 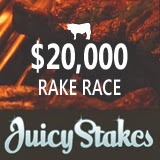 The Rake Race prize pool is usually $10,000 but this month it has been doubled to $20,000. Each week in December the top 100 players will split a total of $5,000 in prizes.Just by playing poker and casino games Juicy Stakes players earn reward points and are automatically entered in the contest. The Sunday GTD tournament begins at 2:00 pm EST and is accessible from the Tournaments tab in the poker software. $125 + $9 buys a seat in the popular Sunday event but players can also qualify through daily satellites. Juicy Stakes attracts players of all stakes and levels since real money tables range from penny buy-ins to high roller ring games.